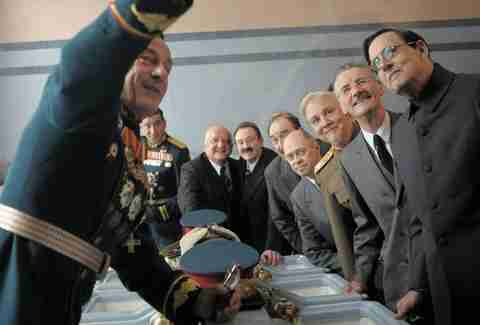 The Death of Stalin, the new comedy from Armando Iannucci, provides the blistering insults one has come to expect from the Veep creator. (For example: "You're not even a person. You're a testicle.") But the film also takes Iannucci into new territory: terror. Just consider the opening moments, which intercut a frantic attempt to record a concerto and appease the USSR dictator, images of citizens are being dragged out of their homes by NKVD security forces, and Joseph Stalin himself forcing his drunk confidantes to watch a movie. And this is just, in Iannucci's words, the "overture." It's all very funny, but it's seeping Soviet paranoia. In Veep -- as well Iannucci's The Thick of It and In The Loop, both featuring his ridiculously profane invention Malcolm Tucker -- the Scottish-born writer-director made an art of detailing the manic incompetency of present-day American and British politicians. Here he delves into the historical record to bring is more power-hungry fools, including Steve Buscemi playing Nikita Khrushchev, as they viciously undermine each other after Stalin's demise. The stakes just happen to be higher. Iannucci got on the phone to Thrillist to explain how he captured 1953 Moscow, and why fiction isn't the correct medium to tackle another fear-stoking era: the Trump presidency. Thrillist: In the New Yorker, Russia expert Masha Gessen describes the film as the "most accurate picture of life under Soviet terror that anyone has ever committed to film." Did you think about accuracy when you're working on this? Armando Iannucci: A lot of the events in the film happened. We've obviously done a comic version of them, but also I think because the film deals with these themes of torture and death and massacres, I think the first thing I said the production team when we started is we have to be very respectful of what happened, and not try and hide it. It made me think that the only way we could go about doing it was to get it as accurate as possible. Go to Moscow, go to the locations like Stalin's dacha, the Kremlin, the apartments and try and recreate them as much as possible. And then explore that world -- read the histories, read the biographies, talk to people who grew up under Stalin at the time. The most satisfying kind of compliments that I've had are from Russians themselves -- the Russian press and just Russian viewers in the audience -- who said, well, one of them said, "Where in Moscow did you film this?" I had to say, "It was in London, but thank you because we did our very best to try and get it right." A Russian journalist told me that within five minutes of watching the film, he suddenly felt back in the Soviet Union, and it all came flooding back to the memories of what it was like. I think that's important. You have to put extra energy and extra concentration and focus in getting it right so that you've earned the freedom to then add the comic exaggeration. Also, I felt the best comedy in it is always from the truth; It's the comedy of people going mad, really, under pressure and under fear and paranoia. They end up saying crazy things. I would assume that's familiar to you because In The Loop and Veep are fictional, but are also accurate depictions of government. Did you see a parallel there? Iannucci: There's a little. Yes, with In The Loop and Veep and so on again we researched. I went out to the West Wing and the White House and the Vice President's office and Washington and observed just what the types are. In the Vice President's office -- who are the four or five people that they would have around? And you build that picture and then you fictionalize, you invent. With The Death of Stalin, there was that, but it was a different period as well. So it was really talking to people about things that happened 50 or 60 years ago. But also I think the comedy in Veep is really about getting through the day, and if they make a mistake it's embarrassing, but they still are alive. In this film, if they don't get through the day it's because they're dead. Suddenly, that shift transforms everything. It's a different type of comedy. It's a comedy about trying to survive and trying to use your wits to just avoid the worst. So we found that the writing of it felt different. The research felt similar, but the actual writing of it and the performing of it was a different thing entirely. How did the writing feel different? Iannucci: Really the aim I think was to try as much as possible to recreate in the audience that sense of low-level anxiety that everyone in the Soviet Union must have felt at the time. That's all about setting things up, suggesting things but never quite seeing them or seeing them in the distance. Or surprising people. Comedy helps because comedy's all about anticipation and build up and expectation and then subverting expectation. The rhythm of comedy is not that different from the rhythm of horror in a way. If you look at Get Out, fantastic film, it's interesting that the writer and director of that has come from a comedy background. He has an instinct for how you can lead people down a path and then surprise them or you can set expectations up one way and then completely subvert them. 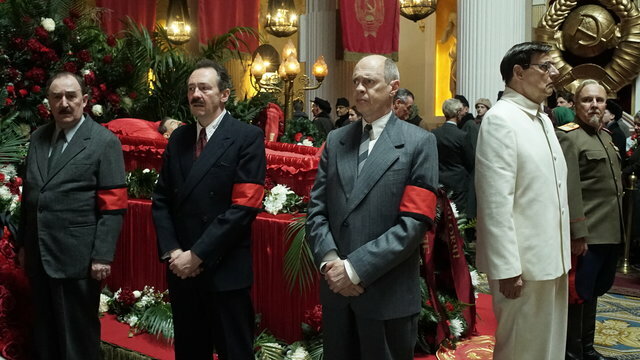 The tone of [Death of Stalin] is all about the edit afterwards. We spent five months in the edit, because I knew we had to get this absolutely right, this balance between the comedy and the tragedy, the farcical stuff going on indoors and then the reality outdoors of what's happening to the people. Balancing the two so you never felt that a joke slightly falls because of something dreadful that's just happened. That, actually, the joke sets up the dreadful thing and the dreadful thing then makes the joke funnier. It's all about that. That was a slow, slow process in the edit, just making sure every moment had a reason to be there really. That sometimes involves taking things out, taking a funny line out because it draws attention to its own joke, and it takes you away from the moment. Or taking a very graphic, visual moment out because it's too much too soon. 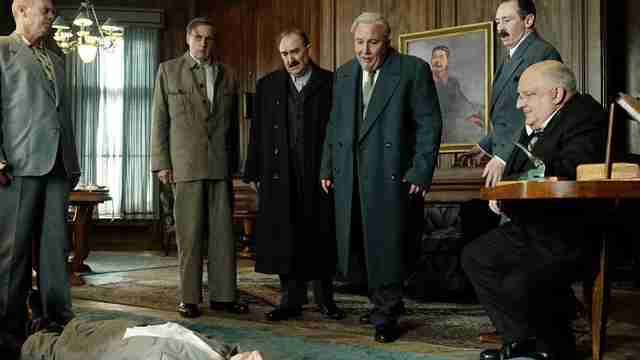 Russia banned this film because it paints these former leaders in an absurdist light. What do you think audiences' relationship to political absurdism is now? Iannucci: Well, it's interesting because the people in Russia who have seen it have said to me two things: It's funny, but it's true. Absurdism makes it sound like this is an artificial contrivance whereas in fact what we've done is tried as much as possible to stick to what actually happened. That opening scene in the concert where they get a conductor in the middle of the night, in real life they got through three conductors. The first one fell over and was unconscious, the second one they got in was drunk so they actually had to get a third one in. I cut that down because I thought people wouldn't believe it. But it was true. Part of it is all about saying, I know that you're laughing at this and I know that you're finding this bizarre and strange but you're also becoming aware that, my God, this actually happened. That's what it's about. And we do that with Veep as well. It's about saying, yeah, this is a comedy, it's a sitcom, the bizarre situation we're actually watching unfold here. But actually you kind of know that in real life that sort of thing probably does happen a bit like that. What was your familiarity with the history going in? Iannucci: I'm a huge classical music fan and the music of Shostakovich, the Soviet composer, was well known to me. He had a tough time under Stalin. Stalin criticized one of his operas and for two years Shostakovich was convinced he was going to get taken away in the middle of the night. The work dried up and he ended up having to write music for Soviet documentaries and so on. I was aware of that and also reading George Orwell. 1984 and Animal Farm were both inspired by Stalin's Soviet Union. But you're right to touch on it in that it's not an era that we know too much about that or that we explore too much in cinema. In the West, it's the Nazis that are the sort of box-office [fodder] really. Or spying, espionage, the Cold War with spies maybe, but not Stalin. Even in Russia, Stalin is very ambiguous, there's no official line about Stalin. People hate him or adore him. It's left to individuals to make up their own mind about him. He swings in and out of favor depending on what's happening. I thought it was just interesting to explore this world that hadn't really been explored close up in a film for some time, really. You were working on it before the current frenzy, but was present-day interest in Russia on your mind at all? Iannucci: Oh yes. I wanted to do it because I was concerned about the rise of the strong man in democracies. So you've got Putin, you've got Berlusconi in Italy, you've got Erdogan in Turkey. You've got [Duterte] in the Philippines as well. These people who are elected but then somehow let power gravitate towards them and it becomes difficult to remove them from power. The whole business of Trump and his obsession with dictators like in China and so on, obviously that came after we shot the film, but that is part of this cycle that's been developing over the last four or five years anyway. Electorates are becoming more and more unpredictable, anarchic. You're getting major parties drawing from nowhere and right-wing movements and nationalist movements growing. It sort of is reminiscent of the language of the 1930s and '40s really, what's happening now. How did you find the comedic voices of characters? Iannucci: I cast it really early so I knew who we were writing for and write to their voice and had conversations with each actor about that. We got them together to rehearse for two weeks in advance of the film, and that's where a lot of the relationships, how they behave with each other, that developed. So that's sort of an organic, dramatic process. Really, almost like we were putting on a play. Then you work out how are they defined in the film. Someone like Khrushchev is the person who is probably the lowest ranking of all the group, [but] I know in 90 minutes time has to turn into the next dictator. So how do we achieve that? That's his kind of comic journey that he goes on. We have somebody like Malenkov, forever the No. 2 is suddenly the number one and then you realize he's just not capable of being the No. 1. So that character is defined by that sense of thinking that he's in control but actually being fully aware that he's not. Molotov, Michael Palin's character, is to do with that absolute rigid adherence to the party line, almost a kind of religious belief in the system and the party and how that sends him crazy really in that he keeps changing his logic to suit whatever it is he's meant to believe in that day. There's something slightly Pythonesque about that. Monty Pythonesque in that the speech he does in the committee meeting in the middle where he keeps wavering one way or the other and everyone's trying to follow his train of logic and work out which way he's going to vote. Once I knew Michael was playing him, we wrote that speech because we thought we've got to have something like that to voice the kind of madness of what the rest of the film is about. How were you thinking about casting? And then the children: What are these children like? One of them is just been promoted too much too far too fast into the Air Force and is entitled and drunk and the other is neurotic and is trying to run away from who her father is but just can't shake it off. I also wanted to get a cast who had different acting traditions behind them. Like TV comedy or Python or stage or you know Andrea Riseborough, she's a chameleon. Every part she does she's completely different. 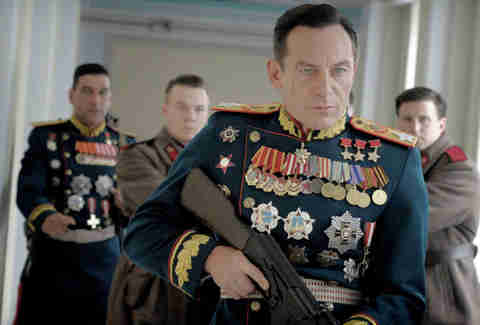 And then Jason Isaacs [as Georgy Zhukov], the sort of action hero coming in to save the day. Was there a significance in casting Olga Kurylenko as pianist Maria Yudina? She's from a Soviet background. Iannucci: She's the purest character there, isn't she? She completely wants nothing to do with what's going and will stand up for her principles. And also I wanted someone who could actually play very well, the piano so we weren't cheating those [shots]. Olga is a classically trained pianist. But, yes, there was something almost by chance that resonated in the fact that she is from that world and knows people who were caught up in it, could bring that connection to it. There's a moment in the film where Beria suggests that Malenkov take a photo with a little girl to mimic Stalin and he says "continuity." That reminded of Selina Meyer's "continuity with change," which was then basically used in real life by the Australian Prime Minister. Why do you think this keeps popping up? Iannucci: I think it's politicians obsession with symbols as if somehow doing something that symbolizes something will therefore make that thing happen. It doesn't it. It's just a label. It's a strange thing and it's always their undoing because nobody quite believes it. Nobody believes them when they are doing these symbolic things. I read that you said you were glad you're not doing Veep anymore because you don't know how you would respond to the situation in America right now. How do you feel about the comparisons between Veep and the Trump era? Iannucci: Well, I'm sort of relieved not to be doing it because I find what's going on in Washington so absurd that the fictional version could never quite match it I think. And I think the Veep writers realized that, which is why they've taken Selina Meyer out of the White House and as far away from it as possible. I don't think doing fiction is really necessarily the thing to do. It's more the likes of John Oliver and so on who actually do journalism about it and just lay out [the] facts. I think they seem to have more resonance really because everything seems so confusing and so absurd that nobody can quite make any sense. It's not that people want to make nonsense out of it, people want to make sense out of it. It is nonsense so it needs someone to just lay some facts out, statistics out and go, how about this, and look at this, and then there's this. That for some reason supplies you with the comedy. No one knows what's actually going to happen, but do you think we'll ever be able to do a Death of Stalin-type look at what is happening now in the world? Iannucci: I think so, but I think we don't know what that story is. It could be something else entirely. For me the unwritten story are the number of people who at the time said there's no way we can have Donald Trump as president in his own party and then who went quiet when he became president. It reminds me of how in the film the people orbiting Stalin are more interesting than Stalin himself. Do you think that's true? Iannucci: That's where the stories are, you see. I think that's where you get the real stories, which is why when we did things like Veep and so on i was always the staffers, it was the people around her that I wanted to find out who they were and what their story was. Have you been following Veep since you've left it? Iannucci: Yeah, what I've enjoyed is actually not knowing what on Earth is going to happen next and what the next person is going to say. They did ask if I wanted to stay involved and I just thought no. It's important that Dave Mandel knows he's in charge and I just want to be a member of the audience now. Esther Zuckerman is a writer based in New York City. Her work has appeared on Entertainment Weekly, The Atlantic Wire, and Refinery29. Find her on Twitter: @ezwrites.